This pillar will strengthen the impact of research and innovation in developing, supporting and implementing Union policies, and support the uptake of innovative solutions in industry and society to address global challenges. 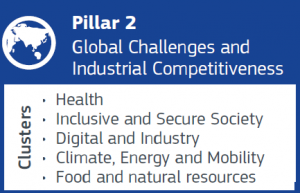 To maximise impact flexibility and synergies, research and innovation activities will be organised in five clusters, which individually and together will incentivise interdisciplinary, cross-sectoral, cross-policy, cross-border and international cooperation. Each cluster contributes towards several SDGs; and many SDGs are supported by more than one cluster. The Strategic Planning Process proposed by the European Commission will be an important new feature of Horizon Europe. It will define multiannual work programmes and calls for proposals. Its aim is to provide transparency and stakeholder involvement, prioritisation and flexibility to align to political priorities and programme coherence and synergies with other programmes. Improving and protecting the health of citizens at all ages, by developing innovative solutions to prevent, diagnose, monitor, treat and cure diseases; mitigating health risks, protecting populations and promoting good health; making public health systems more cost-effective, equitable and sustainable; and supporting and enabling patients’ participation and self-management. Strengthening European democratic values, including rule of law and fundamental rights, safeguarding our cultural heritage, and promoting socio-economic transformations that contribute to inclusion and growth, while responding to the challenges arising from persistent security threats, including cybercrime, as well as natural and man-made disasters. Reinforcing capacities and securing Europe’s sovereignty in key enabling technologies for digitisation and production, and in space technology, to build a competitive, digital, low-carbon and circular industry; ensure a sustainable supply of raw materials; and provide the basis for advances and innovation in all global societal challenges. Fighting climate change by better understanding its causes, evolution, risks, impacts and opportunities, and by making the energy and transport sectors more climate and environment-friendly, more efficient and competitive, smarter, safer and more resilient. Protecting, restoring, sustainably managing and using natural and biological resources from land and sea to address food and nutrition security and the transition to a low carbon, resource efficient circular economy.